This is a completely customized wedding cake topper ordered by one of our customers. The groom is a tree surgeon and the bride is a nurse. They wanted a wedding cake topper to suit their professions. Their idea is quite unique. The groom is climbing on side of cake with his harness system, cutting the cake and nurse on top shouting down at him. This is one of the most difficult design we have ever met. 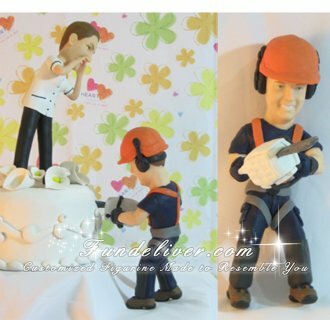 It is easy to sculpt the two figurines with their professional uniforms and gears, such as rope, chainsaw and helmet. But keep the groom’s figurine staying at side of cake is really hard. Since usually wedding cake is not strong enough to hold the groom figurine. We even took a real wedding cake to make a test and found out cake is too soft to hold the groom. Finally we made a small top layer of cake with white clay which turned to be a good idea. Insect part of chainsaw into the clay cake and have the groom’s figurine stand at the second layer of cake. Then it can cut the cake safely and perfectly.